Darren Siwes, an Australian photographer of Aboriginal and Dutch descent, reworks colonial narratives and cultural stereotypes by treating the body as a site of political tension. In his 2013 series ‘Mulaga Gudjerie’ (Man, Woman), Siwes casts an Aboriginal couple as sovereign heads of state. Dressed in imitation regalia that references a generic royal aesthetic and arranged in poses that subtly challenge the conventions of official portraiture, Siwes’s subjects upend the hierarchical structure of the monarchy. The eight photographs in this series, among them ‘Northie Kwin’ and ‘Jingli Kwin’ (meaning ‘Northy Queen’ and ‘Naughty Queen’ in Dalabon dialect respectively), interrogate the divisive boundaries of race and class. The Aboriginal couple standing in as members of the royal family have had their skin roughly painted white with heavy theatrical make-up. They are depicted in a sparsely furnished and modestly regal interior that was constructed by Siwes himself. He sourced and designed everything from the costumes to the wallpaper and the chair upholstery. In this staged space, Siwes’s subjects face the camera. There is nothing passive about their posture or expression. They command authority and respect. 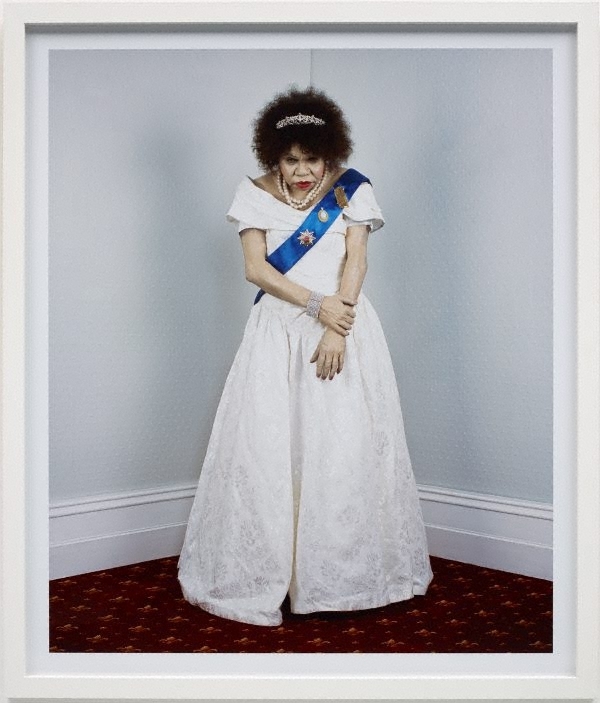 In ‘Northie Kwin’, the queen stands in the corner of the room, a position from which no royal is ever depicted in official portraiture, and clasps one hand over her wrist. The composition of the photograph hangs on her piercing gaze. Despite her hunched shoulders and slightly bowed head, she stands firm. The same rigidity is present in ‘Jingli Kwin’. Seated side by side on settee, their chins slightly raised, they appear unshakable. Their hands gently touch but they remain aloof and reserved. Signed label u.r. verso frame, black pen "Darren Siwes". Not dated.